Dropshipping business can be a sweet income stream if you learn how to do it right. And, the word shipping should not scare you. Now is the perfect time to learn how to start a successful dropshipping business. If you want to make extra money, you can learn how to start a dropshipping business from home. You don’t need to rent a fancy office space to start a dropshipping business. First, let’s get the basics of dropshipping business. You can make extra money today if you use these simple tips now. Can I Pick a Hot Niche? Where Is the Sweet Spot for High Profits? How Do I Know the Target Market for My Online Store? What Profit Margin Can I Expect? How Do I Source for Multiple Products to Add to My Store? What Are the Best Dropshipping Companies I Can Consider? Which eCommerce Platforms Can I Use? How Can I Make It Easy for Clients to Buy from My Store? How Else Can I Drive Traffic to My Online Store? How Do I Meet Influencers in My Niche? Three important people involved in the dropshipping business include the buyer, the merchant (you) and the supplier or the manufacturer. The buyer sees a product they love listed in your store. They make a purchase and you receive the money, pay the supplier the wholesale price and hold on to the profits. The supplier ships the product to the buyer. It’s a simple model. But, you must learn how to do drop shipping if you want to succeed. You need not stock any goods or take inventory when you venture into this business. At no point will you handle the goods you want to sell. Because you need not to buy and store goods, you can scrap out the need for a large capital outlay when you venture into dropshipping business. Phew! No need for a six-figure bank balance to start a dropshipping business. You only invest a little sum and grow it big. Do I Need to Ship the Products to the Buyer? No, you will not ship any products to the buyer. The manufacturer will make sure the product gets to the buyer. This makes your operational cost close to zero with dropshipping business. Yes, zero cost on shipping products to buyers. When you fix the price of your product, it covers the shipping cost. I will tell you how to maximize the shipping cost later on. As an online business merchant, you act as the middleman who sources a buyer and connects a manufacturer to the buyer. You set your own price, look for a buyer and take the profit. Your sole aim is to take the profit. Will My Client Contact My Supplier? At no point does your customer contact the product manufacturer. Your client will address any complaints to you but the manufacturer will replace the product if need be. Make sure you have a refund policy to solve this. Can I Make High Profits in This Online Business? Of course, you can have a successful drop shipping business if you learn the do’s and don’ts. Create your brand, market the product to a large audience and record sales. You need to process orders but you can simplify the transaction by automating it. Your dropshipping business will succeed if you put in the required commitment and invest time in growing it over the long haul. 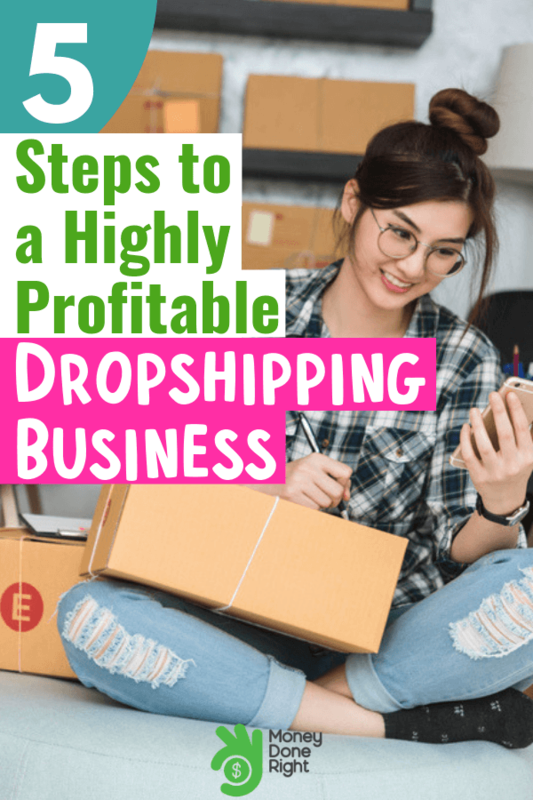 Let’s get into 5 Easy steps to starting a dropshipping business. Here’s how you can save more money on your utility bills with Cushion. It’s automated and super easy! I guess you are wondering what are the best items to drop ship for high profits. Choose a niche you love. This will keep you going for longer and you have a higher chance of succeeding in dropshipping business. If you choose a boring niche, your batteries will die on you. You won’t be able to build the business if you have no interest or knowledge in the products you want to promote. You stand a better chance to succeed once you learn how to start a drop shipping online business,and only if you focus on a niche. Choose an evergreen niche and not a trending niche. If the trend burns out, get ready for your dropshipping business to die. A niche allows you to target a particular audience. If you have a general online store, it becomes difficult to form a trustworthy relationship with buyers. This can lower your chances of succeeding in dropshipping business. A Jack of all trades is probably a master of none. Ok. Now you have a niche product for your online store. Discover how you can make money online now and from the comfort of your home by joining Survey Junkie! You want to make the most profit from selling a product. This will only happen if you select the best items to dropship. It takes the same effort to sell low or high-priced products. Your aim should be to select a high-priced product with a bigger profit margin. And, make sure your target market can afford the product you select. The keyword is your target market. If you want a product for the masses, it should sell for less than $200. For a product retailing at $15 or below, it’s a profitless pit. A good range to consider when choosing products is between $15-$200. This is an affordable price range for many buyers and you can expect to make many sales. But, it must be affordable to ship the product you select. This makes it possible to offer an incentive of free shipping. If the product is lightweight, the shipping costs are low. To entice the buyer, select a product with low shipping costs and hook them with a free shipping offer. Do you know you can earn cash back after doing your shopping? Join Ibotta now, get a $10-signup bonus and discover how you can get money back next time you go to the store. A margin of 40-100% is doable for a successful drop shipping business. Keep in mind the cost of shipping, product cost and tax, when calculating your profit margin. If you are thinking of getting into a concentrated niche, be ready to face the competition. Don’t go up against giants with financial muscle power because you will lose out. A dropshipping company connects you to manufacturers, wholesale distributors and suppliers. All you need to do is select the products they offer and put them up for sale in your store. The drop shipping company will undertake the shipping of the product to the customer. If you want a company with a wide variety of products to choose from, Doba is a leader. You can choose from 2 million products to add to your store. Doba packages range from $29-249/month. Oberlo is another good dropshipping company you can use. Though Oberlo is less costly than Doba, it limits you to using a shopify store and dropshipping from AliExpress. Plus, you can check out more dropshipping companies including Dropship Direct, Sunrise Wholesale, SaleHoo, Wholesale 2B, Wholesale Central, and Megagoods. Now you know where to get the goods. It’s time to display the products to potential clients. To do this, you need to set up an online storefront. The easiest online shopping platform you can use for your dropshipping business is Shopify. Shopify has many tools and apps allowing you to set up your store with ease, even if you are a beginner. But, you can choose from a long list of other ecommerce platforms. These include BigCommerce, Site123, Volusion, 3dcart, Wix, Big Cartel, Squarespace, Lemonstand, Etsy, and X-Cart Cloud. Only invest in expensive web customization when your business can handle the costs. Test whether you can make money with the bare minimum before digging into your savings to get expensive customization. For branding, get a domain name for your store. It makes your brand stand out and customers can easily remember your ecommerce store. To get a domain name, check GoDaddy or Namecheap. You need to organize your store and make sure it’s easy to navigate. Consider having pages such as products, contact, customer service line, customer feedback, shipping info, refunds, FAQs, and promotional offers. Research on websites in your niche and click through the pages. Find out how they organize their store and borrow an idea or two on how you can make yours better. Don’t worry about Internet costs. Here’s how you can get free WiFi now. How Do I Stock Products? From the company you choose, find the products in your niche and stock a large variety. Also, keep checking for new products often because this keeps customers coming back for more. To know more about your customers use Google Analytics. This helps you to know the demographics of your buyers. If you can learn who they are and their needs, you are better suited to stock products that resonate with them. If you don’t want to start from scratch, there’s a way out. Check out Exchange marketplace. You can buy a setup online storefront and market the products to your audience. Once you have set up your storefront, you are ready to sell. You need a payment gateway. You can make money when you visit different websites and do the things you usually do online if you sign up for Swagbucks now. Register and claim your $5 signup reward! You’ve probably seen the words add to cart. Once you click add to cart on an e-commerce website, it directs you to a payment processor. Common payment gateways include PayPal, Stripe, Skrill, 2checkout, Authorize, and Payoneer. The system deducts money from the buyer’s account and deposits it to your account. Using a payment gateway keeps your customers details secure and they can trust your site. Get an SSL Certificate to make sure data transfer is safe. You can get the certificate from WooCommerce, Shopify, or even CommerceHQ. Different payment gateways allow you to deduct money from credit or debit cards. Common cards include Mastercard, Visa, and American Express. How do you select the best payment gateway for your dropshipping business? If you target buyers from a particular country, select the popular mode of payment. For example, Paypal is popular in the US market. In Canada, most online shoppers use Payoneer and Stripe. Also, consider low transaction fees, compatibility with dropshipping stores, and ability to scale up if you want to expand your reach to other countries. For example, Paypal is available for over 203 countries while Stripe only allows for over 20 countries. 2chekout is available for over 87 countries, only 33 countries for Authorize, and 40 countries for Skrill. You can enjoy lowest transaction fees when you use Authorize. Other costs to consider when choosing a payment gateway include the setup cost, recurring cost, and transaction rate. But, to make sure the method you select works for all users, combine two payment gateways. If no one knows your store exists, you can forget making a dime even if your store looks nice and has thousands of products. You must drive traffic to your store if you want to make money in dropshipping business. Discover how you can get cash back every time you buy gas. You will drive anyway, so why not make money while at it? Well, the first known method is to invest in paid traffic. Google Adwords can display your store on banner ads or even Google search results. You only pay for Google Adwords when you get a click, or a potential buyer views your video, or calls you. Two, publish premium content on your blog and your traffic will soar because buyers come to get value from your site. Good value content can include user guides, how to articles, videos, and digital products such as eBooks. But, use SEO optimization for your content if you want to rank well. The more visible your page, the more chances you have to succeed in your dropshipping business. If you are not on the first page, you are losing out. Use a keyword planner. Google Keyword Planner will tell you the most relevant words you should use if you want a high ranking. Other methods to drive traffic include writing guest posts and linking back to your store, email marketing, referral programs, and social media marketing. Facebook is good for videos and buyers are likely to watch your video more than read about your products. You can get a higher engagement with buyers when you use video ads on Facebook. Other social media channels include paying influencers on Instagram, Twitter, and bloggers. Pay them to review your products and put in a good word and you will appreciate the high traffic coming your way. Check out Westagram to find out top influencers and connect with them. The speed at which your website loads on different devices affect your dropshipping business. If it’s slow, you can miss out on over 50% of buyers. To test the speed performance of your website go to Webtestpage. Next time you shop on Amazon, make some money back. Check out this cool tool called Shoptracker if you want to earn some cash back on your online purchases. Remember to sell the benefits of a product to potential buyers. If you only tell them of the features, a buyer can fail to understand why they need to buy the product from you. Once your client buys a product, you finish the process by making an order from the supplier. Dropshipping is a business like any other and it needs a strategy if you want to succeed. What can go wrong sometimes will go wrong. But, you stand a better chance to succeed if you prepare early. You may need to have money tucked somewhere for emergencies that may arise. For example, if goods get damaged, you must order a replacement as you wait for your insurance claim to be processed. Keep your customer waiting and they will be long gone to your competitor! You must be ready to deal with customer complaints and chargebacks. It’s good to know what to expect before you take a dive into dropshipping busness. Yeah! It’s totally worth your time. You are not at risk of holding dead stock when you engage in dropshipping business. Also, you will only part with cash to buy the product at the wholesale price after your customer pays you. A manufacturer who agrees to dropshipping model, can make a profit of 18.33% on average compared to one who does not. Many manufacturers will go this route to make the greatest profits. In 2011, 34% of the products sold on Amazon were as a result of dropshipping. Check out these cool deals on Amazon now. You can make millions in dropshipping business. What can you make of $10000/day in revenues from dropshipping? This guy made a million bucks from his dropshipping business! A dropshipping business is a profitable income stream you can consider. This business model allows you to sell products after setting up an ecommerce store. The supplier ships products to the buyer and you don’t need to handle storage costs or pack any boxes. Once you learn how to start a successful dropshipping business, you can make handsome profits. To recap on what you need, select a niche and a variety of products you can sell. If you get it wrong on the niche selection, you will not make money from this online business. Select the best drop shipping companies you can use to get products into your store. Set up your online store. Make sure your display is attractive and the site should be easy to load on multiple devices. You need a way to access the money so choose a payment gateway. Select it well keeping in mind the need to scale your business at a future date. Drive buyers to your online store, and the more the merrier. Social media stands out as a strong contender among other methods, for its ability to bring you high traffic and decent sales. It’s a must use strategy. Once the buyer opens their wallet, finish the transaction and enjoy the profits. Click here for other great ideas for online businesses you can start and run from home! What is holding you back from starting a highly profitable dropshipping business today?